Digital colorist with a hunger for colors ! After a couple of months without updates, I´ve finally added several new samples at my Gallery from some colorworks I did for Stonearch Books and Top Cow, I´ll be adding some previews on the new projects I worked on the past couple of weeks also from Stonearch. The Jungle Book: This is the third time in a row I team-up with my pal Gerardo Sandoval, this time we are taking care of a new children´s adaptation of this classic story, I´ve seen the first 40 pages so far and Gerardo´s style changed a bit, instead of realistic he went to a toon style, and the way he draws animals is amazing, because of the personality he gives to each and every one of them, the cover and character spread are already done but as soon as I´m allowed to show them I won´t post a preview yet. The Wizard of Oz: Now this is a very cherished project, this time I´ll be joining with another talented artist and friend, Jorge Break, this is the first "manga" book published by Stonearch Books and I hope we can do even more for them in the future. Another thing why I´m very excited about working on a new children´s adaptation of the Wizard of Oz is because my dear mother is a huge fan of the story, so there is alot of feelings being used in the creation of this book. Fighting Spirit.- Jackie Robinson and Jim Thorpe: These are two different books from a series called Fighting Spirit illustrated by canadian talent Claude Saint Aubin. These are not biographical books but instead stories of regular people struggling in life but inspired by these two great sportmen. Also Jason and the Golden Fleece is already being sold all across of the United States, you can find them at Barnes & Noble, Amazon, or Books-A-Million by using the ISBN 978-1-4342-1172-9 , here I´ll share some of my favorite panels from the book. I think this is all for now, but more news and previews are on the way, cheers !!! 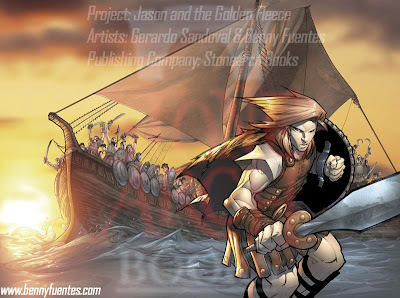 Right now I´ve began production on Jason and the Golden Fleece graphic novel for Stonearch Books, my pal Gerardo Sandoval is doing such a great work on the pencils, here you can see a preview on the cover, sorry for the watermarks but they´re there to prevent art theft, once the book is published (in a couple of months) I´ll update with a better resolution and watermark free file. En este momento comencé la producción de la novela gráfica Jason and the Golden Fleece para Stonearch Books, mi compa Gerardo Sandoval está haciendo un increible trabajo con los trazos, aquí les tengo un previo de lo que será la portada, aunque espero me disculpen por las marcas de agua, pero son para prevenir robo de arte, una vez que se publique el libro ( en un par de meses ) actualizaré el archivo en una versión sin marca de agua y mayor resolución. 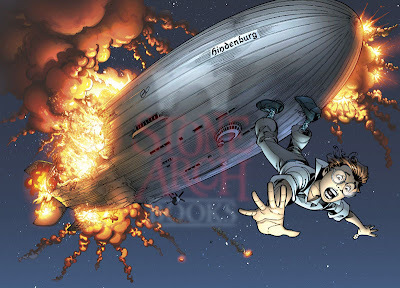 Right now I´m working on some illustrations for a new children´s book called Fire in the Sky: A Tale of the Hindenburg Explosion, that will be published by Stonearch Books in the fall, here is a preview of the cover art, the story is by J. Gunderson and illustrated by Claude St. Aubin. Swiss Family Robinson now available ! 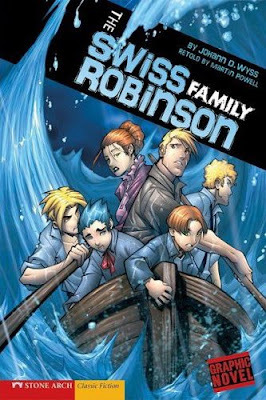 A few months ago I worked on a children graphic novel adaptation of Johann D. Wyss´s Swiss Family Robinson, and it´s now in stores, brougth to you by Stonearch Books!!! Art was done by my compa Gerardo Sandoval ( we make such a great team :D ), and colored by moi, show us some love and go grab a copy ;) you can find some samples at my portfolio. Every time I finish the projects I´m working on before a weekend I always make plans to rest for the next following days, but they always get screwed when I´m asked for urgent works that need to be delivered as soon as possible, which is the case right now, goodbye my plans on playing Battlefield Bad Company all weekend long, hello tons of work. Anyway here´s a preview of my latest project for Stonearch Books, a graphic novel adaptation of Jason and the Golden Fleece, art by my friend Gerardo Sandoval. Enjoy your weekend, if you can !. Siempre que termino mis proyectos en los que trabajo antes de un fin de semana, comienzo a hacer planes para los siguientes dias, pero por una u otra razón tienden a cambiar cuando me piden trabajos de urgencia que deben entregarse lo mas pronto posible, cosa que me acaba de suceder, adios planes de jugar Battlefield Bad Company todo el fin de semana, hola toneladas de trabajo. En fin les dejo un previo de mi mas reciente proyecto para Stonearch Books, una adaptación infantil de la novela Jason y el Bellocino Dorado, dibujado por mi compadre Gerardo Sandoval. Disfruten de su fin de semana, si es que pueden !